Not a lot to write about today because we didn’t do much. Still, I’ll see how far I can stretch this with nothing to say. We got up earlier than normal, before 9 am, so I took a trip to the main floor for a look at the area where they serve a continental breakfast for folks staying at the Lodge. I think I already mentioned that this place is like a very large Holiday Inn and is, in fact, affiliated with Holiday Inn. If you’ve stayed at one of those you will know that they have a very nice breakfast room. Well, think about that for a second, then expand the room to about 100 x 100 and you’ll get a sense of what this one is like. Seriously, it’s that big. OK, maybe it’s only 100 x 75. Still big. To the left of the door there is a curving self-serve area with boiled eggs, waffles, french toast, yogurt, milk machines, oatmeal, grits, fruit, toasters, and what looks like an omelet bar that was closed when I got there, that’s about 80 feet long. Around the corner in the seating area, the BIG seating area, is a table with a vast array of coffee pots and things you can put in coffee cups to make it taste better. I was so amazed with this room that I just got a couple of cups of coffee and took them right back up to the room and convinced Diane she needed to put some underwear on and come down with me to look at it. She did. She was amazed, too. We both ate but I made a bad choice and got french toast and actually put syrup on it. This resulted in an elevated BS level that needed attention with some exercise and water. So, we went outside and walked around the hotel. It took about 15 minutes to do that. I drank a bottle of water on the way. This made my stomach settle down and by BS level was down indicating it was going the right direction. Here’s a bicycle we saw during our walk. It’s been there for a long time. 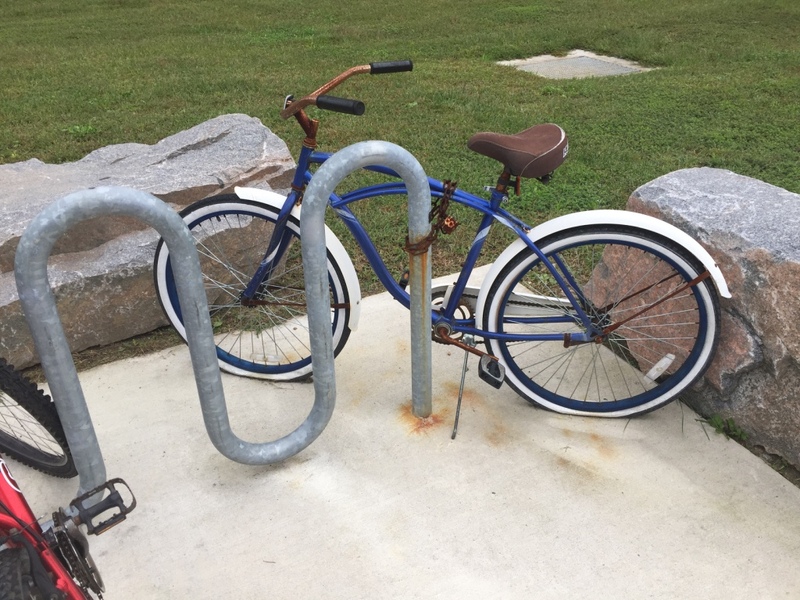 We think it’s probably a loaner bike because we saw more just like it at other bike racks around the base. Then Diane decided it was time to visit the commissary to get things to last through the storm, just in case it decided to slam us, too. I already had 8 boiled eggs, from the hotel cafeteria, so egg salad was on the menu. Just needed mustard to make it really good. While at the commissary, we continued our exercise by walking up and down every isle in the place. We went at a moderate pace, just slow enough to keep from sweating. There were so many bags of food I had to use the luggage cart to get them to our room. Diane put things away while I took the cart back to the lobby. By the time I returned it was pretty much cleaned up and ready for me to make that egg salad. I used four eggs which gave us enough for four sandwiches. Since we only ate one each, there’s more for tomorrow. Before I ate, however, I checked my BS again. It was down to 90 and I could tell it was time to eat. I may have salivated a little bit while make the egg salad, but I’m pretty sure I didn’t salivate on the eggs. I’m guessing, of course, because it would’ve blended right in and there was no way to tell for sure. So far, Diane hasn’t displayed any symptoms of sickness of any kind so think I’m good here. Until she reads this. Then it’s lights out and means I’ll get to eat the remainder of the egg salad all by myself. Unless Cedric wants some, of course. We should be picking him up for a day of hanging out, visiting, exploring, and napping. 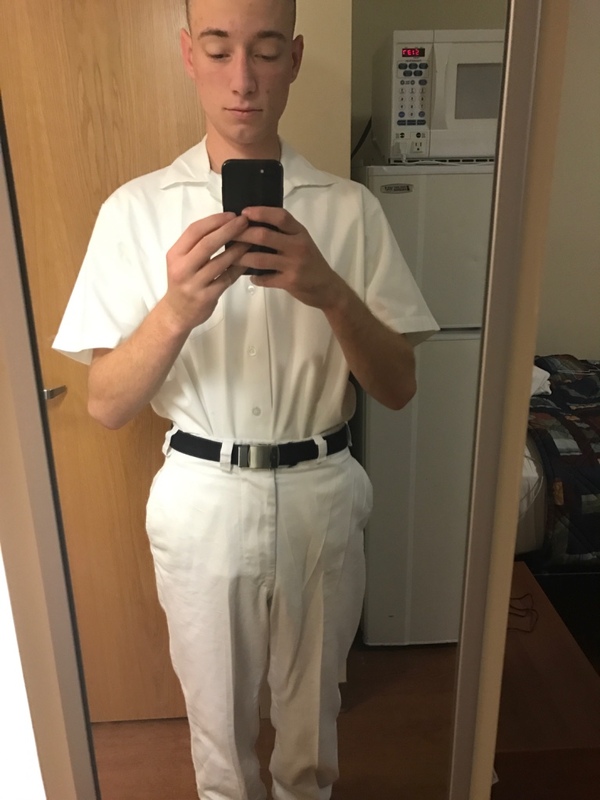 Here’s an off topic photo Cedric sent this afternoon of him in his cooking class uniform. This afternoon, when Diane couldn’t find anything interesting on TV, she lay down on the bed and took a very loud nap. I, on the other hand, stayed in the living room portion and watched a movie – “The Fifth Wave”. On my iPad. We don’t know how to watch movies on our TV. Besides, all the channels are analog, not digital. It’s still a good picture, though, so can’t fault them for that. The majority of folks staying here are Army officers, new and old, who are, I believe, affiliated with the Logistics University adjacent to the Lodge. When the movie was almost over Cedric texted me and we started going back and forth, carrying on a conversation. We didn’t know at the time that the text link he used also included his Mom. I was very thankful that we kept it clean because she surprised us both when she chimed in and commented that while she was gone taking her Mom’s Mom, Jean, to the doctor, she received 87 texts. Neither of us had any idea we had carried on that much. Now it’s 2230 here and we’re getting updates from Jennifer about the soccer game going on in St. Helens. 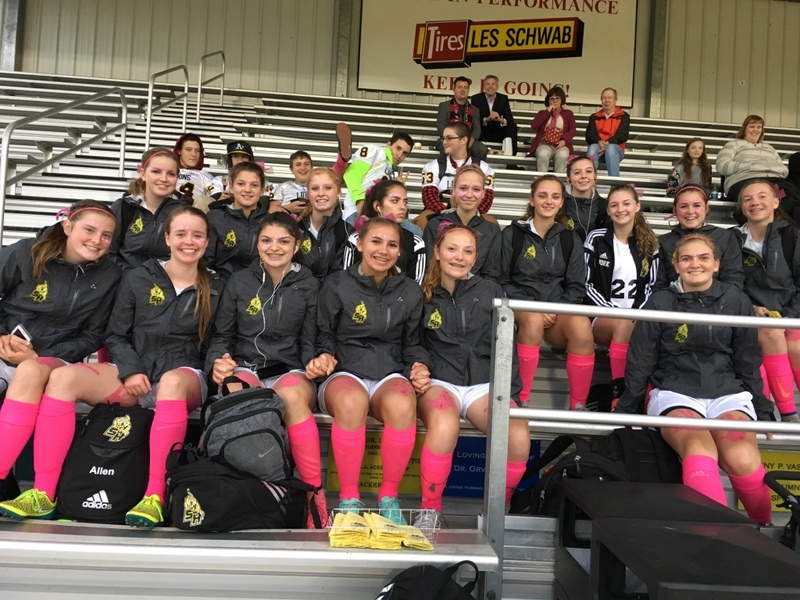 Our girls were winning 3-0 against Milwaukee. Our girls are 7-2 going in to this game and are ranked 4th in the state. They are doing extremely well. I’m told the Milwaukee girls aren’t taking the beating very well and have started with dirty tactics. It’s Pink day. 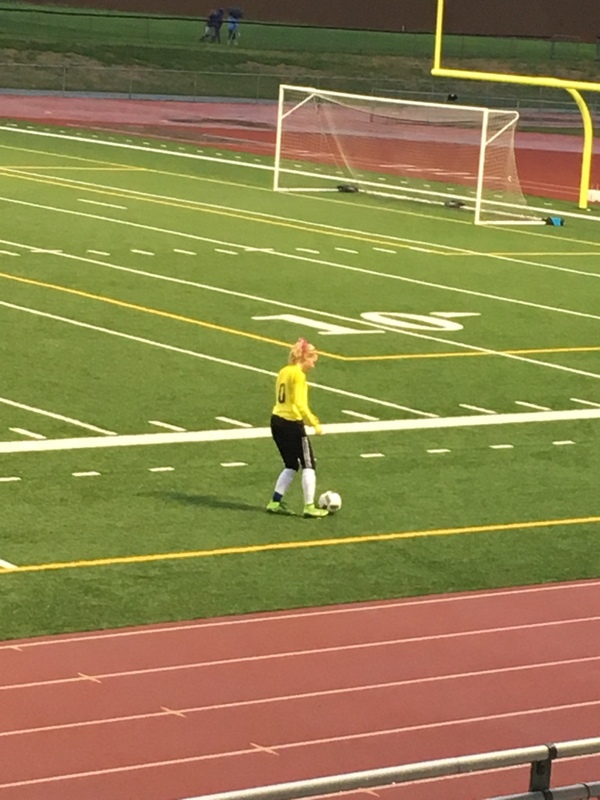 Since Lydia’s a goalie she dresses differently than the rest of the team so she didn’t have pink socks. Just pink paint on her face. Jennie sent the next photo with the comment, “She’s wearing pants.” First time this year. Normally she wears shorts. But, she said it’s raining buckets at home now and I suspect pants would feel pretty good. But I think pants feel pretty good any time of the year. This entry was posted in Family, Food, Naps, Shopping, Sports, Travel. Bookmark the permalink.